Hemibagrus: from the Ancient Greek ἡμι- (hēmi-), meaning ‘half’ and the generic name Bagrus. macropterus: from the Ancient Greek μακρός (makrós), meaning ‘long’, and πτερόν (pterón), meaning ‘feather, wing’, in reference to this species’ long adipose-fin. This species has been recorded from the Zhujiang (Pearl River), Changjiang (Yangtze River) and Qiantang Jiang in central and southern China. Type locality is ‘Chang Jiang, China’, referring to the Yangtze. It’s been adversely affected by dam construction and pollution across certain parts of its range and may be locally extirpated in some cases. Inhabits swiftly-flowing rivers and tributaries with rocky substrates. The largest officially-recorded specimen measured 408 mm. A predator feeding primarily on invertebrates and smaller fishes, although there should be no need to use such live foods in captivity. In nature it breeds in June and July with up to 2000 eggs being deposited in a single spawning event. The larvae are fully developed in about 20 days. This species seems virtually unknown in the aquarium trade but is fished for food within its native range. It can be told apart from most other congeners by the diagnostic characters given in Ng and Kottelat (2013) for the H. guttatus species group (see below) and from other group members by possessing a single-chambered (vs. double-chambered) swim bladder, a dark brown body with only a few small black spots, plus the adipose-fin is partially confluent (vs. not confluent) with the principal caudal-fin rays. Hemibagrus has been divided into a number of putative species groups which may or may not represent monophyletic assemblages, and following a major review by Ng and Kottelat (2013) H. macropterus is included in the H. guttatus group. Members of this assemblage can be told apart from other congeners by possession of 51–59 vertebrae, an adipose-fin with a very long base extending along most of the postdorsal distance (greater than 30% SL) and colour pattern comprising a grey or brown body, usually with numerous dark brown spots. Currently valid species are H. guttatus, H. macropterus, and H. vietnamicus, while Aoria amemiyai Kimura, 1934, listed as species inquirenda in Hemibagrus by Ferraris (2007), is now considered synonymous with H. macropterus. The genus Hemibagrus currently contains 40 nominal species which are distributed east of the Godavari River system in India and south of the Changjiang (Yangtze) drainage in China, with Southeast Asia a particular centre of diversity. Many species are important food fishes and some are cultured for the purpose, or for sport angling. Hemibagrus has previously been considered synonymous with Mystus but following Ng and Kottelat (2013) members can be diagnosed by their moderate to large adult size and strongly-depressed head shape with the interorbital region normally flat or slighly convex. The grouping also shares a number of characters with the genera Sperata and Bagrus, and these three can be separated from other bagrids by the following: mesethmoid highly depressed (vs. not highly depressed), prominent (vs. reduced) dorsoposterior laminar extension of the mesethmoid, the ﬁrst infraorbital with (vs. lacking) a posterolateral spine, enlarged (vs. moderate or small) premaxilla, and the metapterygoid with a long, free posterior margin (vs. contacting quadrate and hyomandibular). Hemibagrus can be told apart from Sperata by possession of a a relatively short and slender (vs. enlarged and elongate) interneural and by absence (vs. presence) of a concave surface in the posterior portion of the posttemporal in which lies a portion of the swimbladder. It’s distinguished from Bagrus by possession of 7, very rarely 8 (vs. 8-10) soft dorsal-fin rays. Notes on the identity of Hemibagrus elongatus (Günther, 1864) and other East Asian species allied to H. guttatus (La Cepède, 1803) (Teleostei: Bagridae). 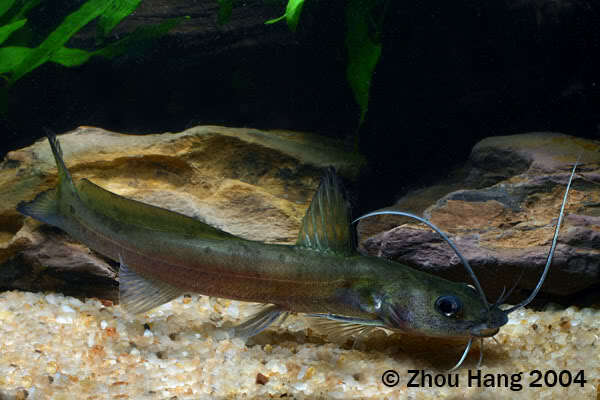 Revision of the Asian catfish genus Hemibagrus Bleeker, 1862 (Teleostei: Siluriformes: Bagridae). The freshwater fishes of Guangdong Province.